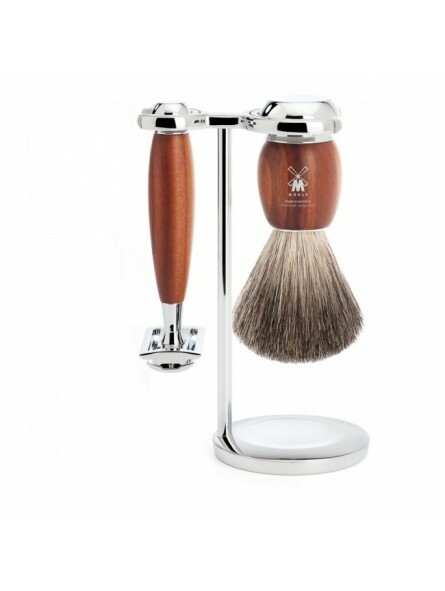 Mühle Vivo Shaving Set Pure Badger Shaving Brush & Safety Razor Plum Wood. 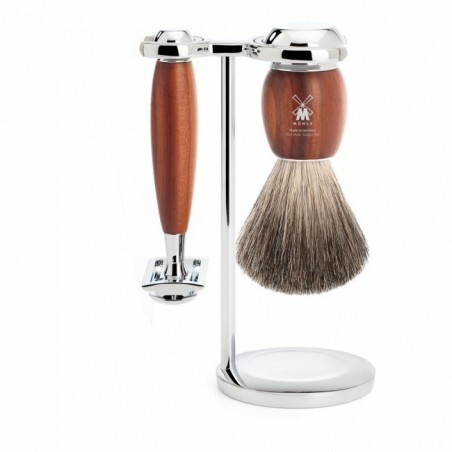 A 3 piece shaving set with chromed metal accents and handles made of high-grade resin. Pure Badger Shaving Brush - Pure badger hair is the most common hair used to manufacture shaving brushes. It’s solid quality for wet shavers who like a massaging effect while preparing to shave. The band of natural hair is machine-made, and the hairs are more flexible than bristles. The colour spectrum ranges from brownish-grey to black. It is the entry level badger for most manufacturers and it comes from most part of badger body. Pure badger is usually dark colour but fluctuates from light tan to a near black or silver sheen. Safety Razor – Closed Comb safety razor compatible with classic double edge razor blades. A precise and quality razor. Plum Wood Handle Material – Shaving brush handle and safety razor handle are made with plum wood material. Plum Wood has been historically use to manufacture instruments, furniture, etc because it is a hard and robust wood. To protect it against water, the surfaces are sealed once again with oil.